Old-Drava oxbow and the whole Drava river stretches are in the heart of the Transboundary UNESCO Mura-Drava-Danube Biosphere Reserve, which will combine the cluster of thirteen protected areas along in five countries and is planned jointly manage the shared river ecosystem in a sustainable manner. The Biosphere Reserve concept defines about 300,000 hectares of core and buffer zones (existing protected area network) and around 700,000 hectares of transition zones. The core zone is the ecological backbone of the reserve. It primarily covers the river and floodplains areas which are mostly situated within flood control dikes. The buffer zone extends along the rivers outside the inundation zone. It is characterised by a mosaic of cultivated land and village areas and also contains some smaller detached zones like oxbow lakes, fish ponds and small wetlands. Extensive agriculture such as cattle grazing, hay making, organic production, local products marketing and ecotourism are some of the key activities in this area. The outer transition zone provides regional economical and scientific support to the buffer zone. The majority of settlements are situated within this area. The time to rediscover our connection to nature is now! Aside from living river ecosystems in the Mura-Drava-Danube area, the vision of the international cooperation is to stimulate nature-friendly development for local communities by inspiring feelings of both provincial and regional pride. We can imagine the living rivers with dreamy islands, natural river shores of pebble and sand, network of mysterious river arms, lush floodplain forests with astonishing old trees, flourishing bird and wildlife with black storks stalking along shallow river shores catching small fish, thousands of sand martins catching mosquitos to feed their youngsters in natural river banks, sterlets laying their eggs on gravel shoals. 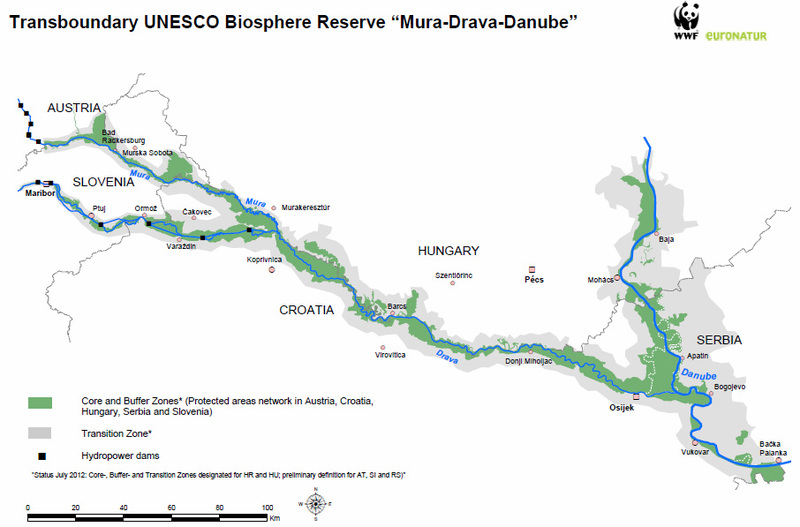 The people in the Transboundary UNESCO Biosphere Reserve Mura-Drava-Danube will live sustainable in a healthy ecosystem, with a diversified local economy and strong, vibrant and united cultures embracing the unique values of this area. International cooperation of non-governmental organisations is the engine of this transboundary network. The NGOs develop projects for improving ecological status of rivers and riparian habitats, work together against threats and lobby for the cooperation of responsible governmental bodies and decision makers in order to make visible the international cooperation for the wider public.